We were invited by Audi to Basel, a little city on the junction of three countries - Switzerland, France and Germany. Interestingly, the car we drove here is a meeting point of three characteristics - speed, grip and practicality. The car in topic is the Audi SQ7. 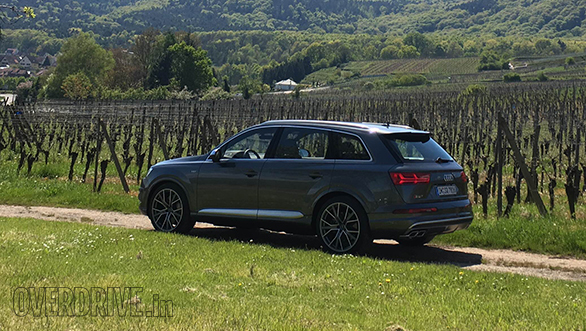 The 'S' in the SQ7 could stand for 'sport' or 'speed', but to me the 'S range' from Audi is more like a 'sleeper' avatar of an otherwise sensible car. Sleepers are standard cars that look more or less similar to their regular commuter counterparts but pack some serious firepower under the hood. The SQ7 fits in this category quite well. Unlike an AMG or an M car, it doesn't wear any wicked bodywork. Instead, the SQ7 uses similar grille, headlights, tail lights and door cladding from the regular Q7. The only giveaways are the badges, different colour options for the grille and mirror caps, a different pattern/larger size for the alloy wheels and the quad pipes. The latter is the easiest to identify though, and that's the bit most road users will get a glimpse of if the SQ7 finds open roads. Even on the inside, the changes are quite subtle. The flat-bottom steering wheel comes from the Q7 S-line. If you choose the car without the TFT instrumentation, you get specific white faces for the analogue clocks. Additional S badges, the aluminium and carbon inserts in the dashboard fascia and the optional sports seats differentiate the SQ7 from its base sibling. Even this sportier version is offered with the choice of five as well as seven seats. But quite frankly, it leaves you wanting for a bit more in terms of design flair, given its sportier side. But then, a sleeper she is. 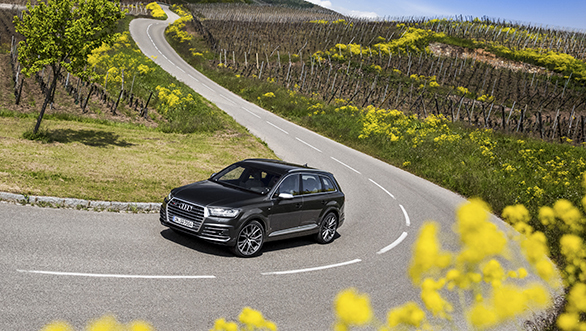 The equipment won't make you feel shortchanged though as there is plenty of it like the Q7. On the European model we drove, a lot of equipment is a standard fitment too. I won't get into the creature comforts as we have already spoken about it with the Q7, because the engine and the electrical system are the ones that create the headlines. The engine under the hood is a V8 and gets two turbochargers. But to eliminate the age-old problem of turbo-lag, an electric-powered compressor (EPC) comes to the rescue. Since it is powered electronically, it doesn't rely on exhaust gases or a pulley like a conventional turbo or supercharger would. Instead, it can spool up to 70,000rpm and provide boost from the word go. And it works. Around the tiny back roads or through traffic or even while overtaking, I didn't feel much of a lag. The 8-speed transmission complements it well as it is quick to respond to even part throttle input. As the revs climb and there is enough exhaust gas, the sequential turbocharging system takes over. The engine uses Audi's new valve lift system. As you know, each cylinder comes with two inlet and exhaust valves. But using two different contours for the camshaft, Audi's system allows only one of the two sets of inlet and exhaust valves to function at lower engine speeds. The second set comes into play at higher revs. Similarly, one of the two turbos is mated to the bank of exhaust valves that function at lower revs and take care of the mid-range. The second turbo works with the second bank at higher revs, essentially enabling a bi-turbo configuration. In a nutshell, power is seamless throughout the rev range. 0-100kmph, as Audi claims, comes in 4.8s. That's a whisker under the sprint times of the larger engine Range Rover SVR (4.7s) and the Mercedes-AMG GLS63 (4.6s). 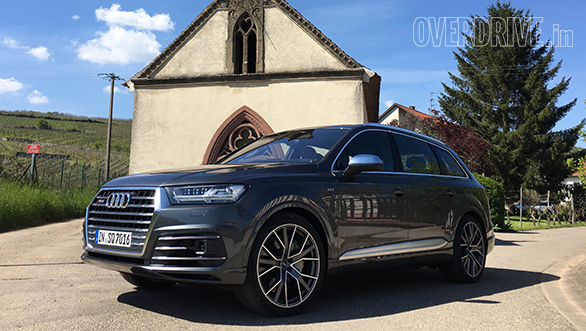 Despite that, it is still a big deal because, while both those cars get petrol engines, the SQ7 is a diesel! In fact, those figures make it the quickest diesel SUV in production, trumping the BMW X5 50d and even the Porsche Cayenne GTS diesel. The triple-charging works the magic here and churns out 435PS of power and a massive 900Nm of twist from this 4.0-litre oil burner. 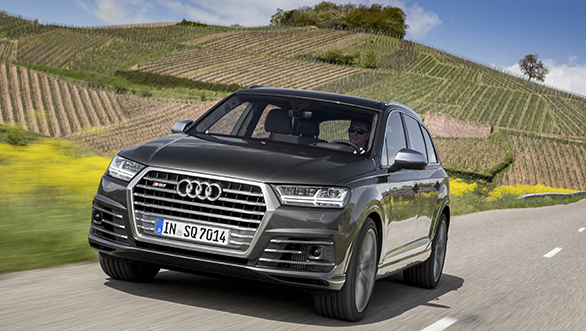 It is not the first time that the Q7 is getting a large diesel engine though. The previous generation model came with a 4.2-litre V8. But the new mill exceeds it in all respects. In fact, it also goes the extra mile and synthesises the sound of a typical German V8 through a set of external speakers around the exhaust system. Under the cargo area is a 48-volt lithium-ion battery pack that complements the conventional 12-volt battery up front. While the 12-volt system is the primary unit and takes charge of the run-of-the mill electronics, the complimenting 48-volt sub-system takes care of the more complex stuff like the electromechanical suspension and stabilisers and more importantly the electric powered compressor or EPC. Between the compressor and the stabilisers, they need 10kW of energy (7kW and 3kW) respectively. The regular 12-volt system wouldn't be able to produce that sort of energy, and hence the need for the 48-volt system. 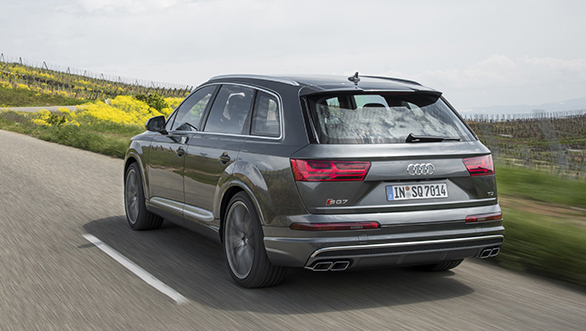 The Q7's adaptive suspension and four-wheel steer had impressed me the last time I drove the car. The SQ7 upgrades it a level higher. While it is surprisingly impressive even on broken roads, the suspension now also gets an S mode which stiffens the setup further for a lesser lean through corners. The active stabilisers add to it by countering the effects of body roll when you push the car through bends. On undulated surfaces, they shift to a more comfort setup. Since they are electrically controlled, they adapt to changing road conditions quickly. They are low on maintenance too as they don't use any oil. The quattro system and its 40/60 F-R bias make the handling quite predictable. The wide, sticky 245-section tyres enhance the handling characteristics further. On the range topping trim we drove, the low-profile tyres for the 22-inch rims also come with excellent side-wall and rim protection. These wheels may not make to India though. Audi India could settle for the 20-inchers instead. 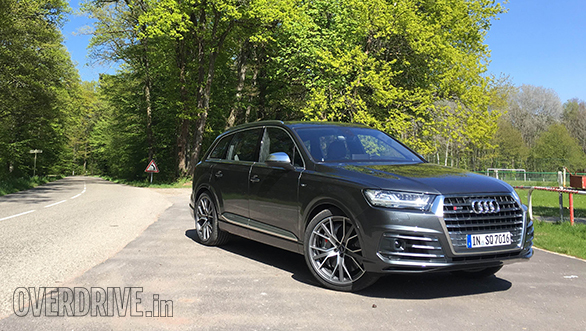 The SQ7 will arrive in India in a few months at an expected price tag of Rs 1.2-1.4 crore and will rival all the aforementioned cars in this review.